Happy Valley Music Fest 2019 is May 31 - June 1 in State College, PA! “All that I know how to do is take a pen and a sheet of paper or two, write a few words about peace and love, Louisiana and the heavens above; Bury me when I am gone, with my guitar and some cheap cologne, all that’s left is a pile of bones, remember me through the words of my song.” – Jonathon Long ‘Bury Me’ The road to Samantha Fish’s Wild Heart Records winds along the Big Muddy through Baton Rouge, where young guitar players travel to learn from and experience the legacy left there by the likes of Buddy Guy, Kenny Neal, Tabby Thomas, Lightnin’ Slim and so many others who fueled that vibrant blues scene going back decades into the last century. Eighteen years into century twenty-one, Baton Rouge born Jonathon Long (he’s retired ‘Boogie’-more on that later) has claimed his own share of that legacy. He has mined, refined and re-defined his beloved blues for over half of his 29 years. The shuffles and homages to the King’s and Collins’s, along with his mastery of the red Gibson, have evolved into what will certainly be a milestone in that legacy, his third album, titled simply ‘Jonathon Long’. 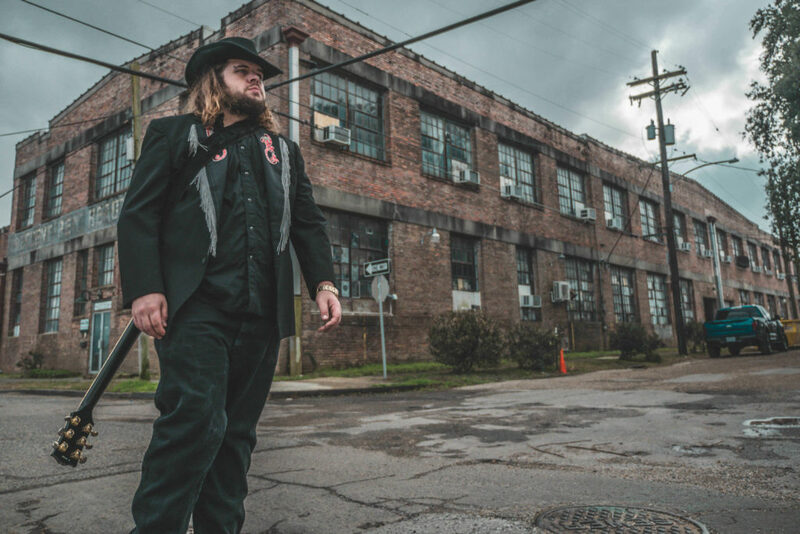 Recorded in post-Mardi Gras New Orleans earlier this year at NOLA Recording Studios, ‘Jonathon Long’, produced by 2018 Contemporary Female Blues Artist of the Year Samantha Fish, is an extra-ordinary collection of 11 songs, all written by Jonathon save for ‘The River’, written by Detroit’s Kenny Tudrick, a Samantha Fish cohort and drummer for the Detroit Cobras. Long is joined on the record by bandmates Chris Roberts on bass and Jullian Civello on drums, giving it a ‘live in the studio’ sonic signature. The ten Jonathon-penned tunes are timely, personal, outright spiritual and infused with an intentional, infectious spirit and soul. Alternating between near-despair and boundless hope, the songs evoke that delicate balance of drawing you in and fixating you with provocative lyrics, familiar yet fresh riffs and clean, tight arrangements that shine on record and powerfully resound live. Each track gets its own special guitar treatment, from spare and simple acoustic rhythms and fills to in- your-face ‘straight into the board’ sonics, arranged and performed with the dues-paid passion and prowess Jonathon brings to his craft. Such focus and determination are nothing new with Jonathon, a working musician before he was old enough for a learners-permit to drive. He’s absorbed from and shared the stage with masters like B.B. King, won a nationwide blues guitar unsigned artist contest, produced his own instructional videos, is a regular at the Blues Tent at the New Orleans Jazz and Heritage Festival and stays on the road, playing concerts, clubs and festivals here and abroad to a passionate and growing fan base. New fans discover what long time fans already know: Jonathon Long is a musical and spiritual force of nature, with a searing mastery of his instrument who as an artist and fellow human walks the walk while singing the talk. The songs on ‘Jonathon Long’ range from straight ahead blues, to stories of heartbreak, yearning, hope and redemption, to a drinking song. His own spirituality is front and center, but in a positive, non-preachy manner. “Everyone has their own image of what a perfect world should be; my goal is not to persuade what to believe, or convert anyone, but to have people hear and realize you can do what you want, have fun, and find ways to peaceably coexist with the other people in this world. We are never about negative anything. We want to show up, bring on the heat, and have it all come together through the music,” he tells. Hear and see for yourself. A fond farewell to Boogie, and a hello and welcome to ‘Jonathon Long’. © 2019 Happy Valley Music Fest | All Rights Reserved.